Carolyn Haywood was a twentieth century author who clearly understood little children very well. I haven’t yet come across one of her books that my children and I didn’t absolutely love. 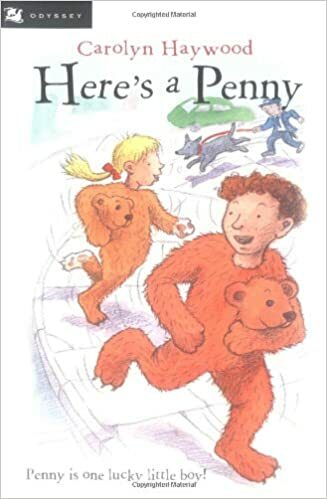 In Here’s a Penny, readers are introduced to a funny little boy named William, but who everyone calls Penny thanks to his copper-colored curls. Penny is six years old in the book, and always tumbling into silly situations which often include his next door neighbor Patsy. There’s a sweetness in the simple story, evident in all of Ms. Haywood’s works, that makes it especially appealing to little children. I read it to my daughters when they were about four and a half years old, and many months later, V was giggling about a scene she remembered from Penny’s adventures. Throughout the tale, Penny becomes the accidental owner of two very mischievous kittens, enjoys a surprise from his mother when he goes to a costume party, earns money for the first time, gets the seat of his overalls glued to a barrel, and even gets a new brother- an older brother, just like he’s always wanted! Every chapter has a fun and interesting story to tell, as well as simple illustrations that add even more charm to a delightful book. As a mom of littles, I’m always looking for opportunities to expand their understanding in gentle ways. Here’s a Penny provided a lovely chance to talk with my daughters about adoption. Penny himself is adopted, and at the end of the story his parents adopt a second little boy to be his big brother. Ms. Haywood treats the topic very gently and sweetly, and I so enjoyed opening my daughters’ eyes to what adoption is, as well as seeing how different aspects of adoption affect Penny and his relationships with his parents, his friend Peter, Patsy, and even his kittens. Of course, the adoption process today is much different than that which is briefly described in the book, but the love and sense of real family rings beautifully true. This book is a perfectly delightful addition to any family’s library, appealing to both boys and girls and an enjoyable read for the parents, as well.